Winter’s coming, but frozen yogurt is already here. Love Yogurt opened at the corner of Atwood and Sennott streets two weeks before Thanksgiving, becoming the third froyo shop in Oakland, but the first to also serve crepes and Asian-styled beverages and desserts. It’s a cozy, beautifully decorated lounge spot with high-speed Wi-Fi and comfy chairs — exactly what students need as they prepare for finals week. With a whopping 12 flavor collection, Love Yogurt lives up to its name. Besides the conventional flavors such as mango, vanilla, tart and taro, it offers seasonal and adventurous flavors — like red velvet, apple pie, passion fruit, toasted marshmallow, cotton candy, the list goes on — and introduces a different flavor every week. For Thanksgiving, the owners brought out the pumpkin pie flavor. If you have a hard time choosing what to put in your yogurt cup, you’ll probably be emotionally paralyzed by the amount of options waiting for you at Love Yogurt. 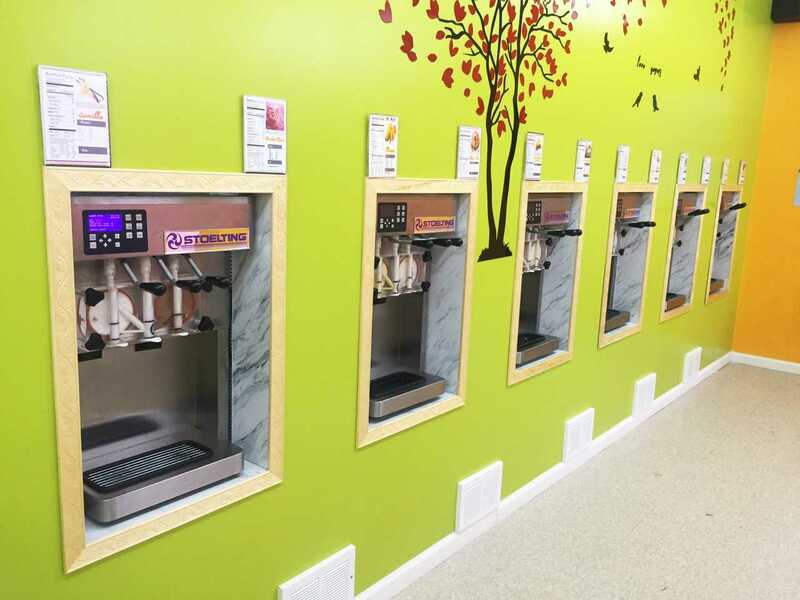 The froyo store features not one, but two separate counters for their more than 50 topping options — one for fruit-based toppings and the other for berries, cookies or wafers. By the time I finished decorating my bowl, I was sure there were more toppings than froyo in there. There’s no such thing as too many toppings. Love Yogurt won’t just impress you with its yogurt. Offering a selection of crepes, authentic Asian desserts and beverages, Love Yogurt is a one-stop location that fills you up, quenches your thirst and satisfies your sweet tooth. Its crepes menu alone is worth the trip. There’s two lists of crepes that cover both sweet and savory demands with options that range from Chocolate Nut Party to Shrimp Avocado. The taste isn’t the only treat, either — customers see their crepes prepared in front of them with fresh ingredients. A free hot beverage comes with every crepe order, which ranges between $5.95 and $6.95. For my first try, I ordered a seaweed crabmeat crepe for $6.95. When the owner handed it to me, its presentation caught my eye before the food itself did. The crepe was nicely wrapped in a cute paper sleeve that displayed it in a small cone shaped stand. The bright colors combined with a rose-like shape made my lunch look like a bouquet. I took a bite and I immediately knew this would be my new go-to for a delicious treat. The crunchiness from the seaweed strips complimented the freshness of crabmeat and tangy, spicy sauce. I chowed down on my crepe, and it was gone in minutes. The food will fill you up, but be sure to save room for dessert. Love Yogurt is the first establishment in the Pittsburgh area that serves an authentic and wide variety of Asian desserts. Under its menu I spotted items that I haven’t had a chance to try since I moved to the United States from China. I went with mango pomelo sago — frankly I wasn’t sure what sago or pomelo meant, but was not disappointed. Mango pomelo sago is a Hong Kong dessert served cold, made with mango, pomelo — a citrus grapefruit — sago, coconut milk, cream and sugar. It’s a traditional summer dessert with a tropical, refreshing taste combining the bouncing, chewy texture of sago, a smaller, clear starch ball that resembles tapioca. It’s fruity and sweet but not smothering — plus, it’s healthy. Like most items on the dessert menu, it’s best if you ask the owners what they are since most of their names can be confusing. The dessert menu also covers more conventional treats from pudding to brulees, and panna cotta to tiramisu. If it’s not apparent already, Love Yogurt is not a conventional restaurant. During my second visit, I had a taste of the matcha tiramisu. Again, Love Yogurt presents its food like a work of art. They packaged the matcha tiramisu in a delicate bamboo container, with whipped cream and matcha pocky stick on the side as garnish. It took me quite a while to actually dig in because I didn’t want to disturb its breathtaking aesthetics — but I’m glad I did. Fluffy, finely mixed, light and yet still satisfying, the matcha flavor — a type of green tea — lingered in my mouth. If there is such a thing as gourmet dessert, it would be Love Yogurt’s matcha tiramisu. Love Yogurt also offers a line of freshly prepared Asian style beverages, served both hot and cold, to go with their yogurt, crepes and desserts. With flexible hours from 10 a.m. to 11 p.m. daily, Love Yogurt is ideal for a late night study break, breakfast or lunch in a pinch.